December 4, 2016 August 16, 2017 Melissa P.
On our way to London, we flew into Dublin because it was cheaper than flying directly into London. 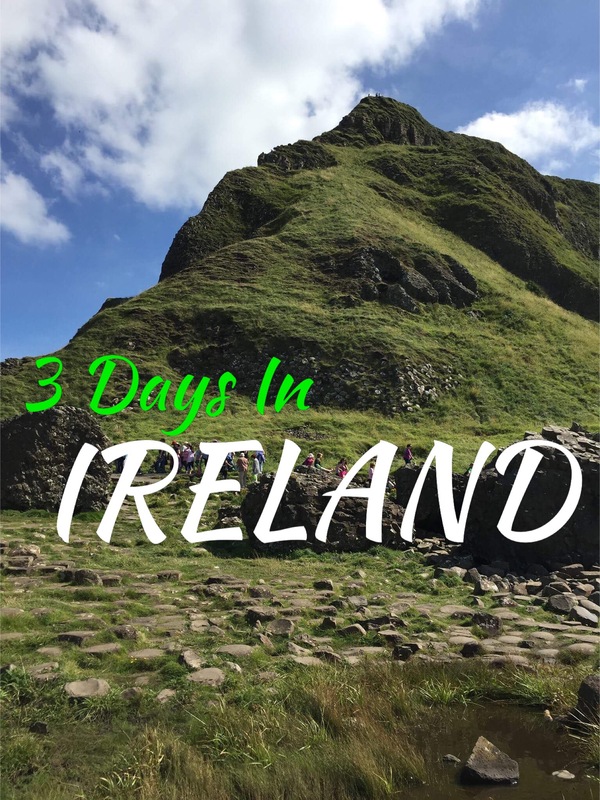 So we ended up with two partial days in Dublin and one full day that we used for a day trip. Dublin is pretty small so we were able to walk everywhere. Even though we were there a short time I felt like we saw everything we wanted to see and got a good feel for the city. Here is the itinerary from our trip to help you plan your own adventure. Dublin is definitely a night time city. We arrived at 7:00 AM and dropped off our luggage and decided to head out to find a place for breakfast. Apparently, everyone else was still asleep and since it was a Sunday, most of the places didn’t open till 10:00 or 11:00 for Sunday brunch. The streets were empty and it was a great time to take pictures. We wandered around and stopped in some tourist shops to do some shopping. St. Stephen’s Green is so beautiful. We even saw swans. Be sure to take your shoes off and put your feet in the grass! There was a huge line to buy tickets when we arrived. We didn’t want to buy in advance because we weren’t sure what time we would get there. No worries though, you can buy your tickets online the same day. It may be a little risky in case they sell out, but this is what we did and it worked out for us. You can find a seat and relax or explore the grounds until your ticket time comes up, we waited maybe fifteen minutes. Then just strolled by all the people in line and walked right in. We seriously were feeling the jet lag at this point and needed a nap. Once refreshed we headed out for an early dinner. We walked around after dinner and it led us to Dublin castle. We found an outdoor theater next to Dublin Castle. Luck was on our side that a Shakespeare play was taking place when we arrived so we stopped to watch the rest of it. Time for a drink. We headed to Temple Bar so we could have a Guinness in an Irish pub! We cut the night short from there and headed back to the hotel because of jet lag and the early morning we had coming up. We are lame, I know! I have a love-hate relationship for my first ever bus tour. I loved all the natural beauty I got to see that day. I hated not being in control of what I was doing, the fact that I felt rushed at all the sites. Plus the fact that we ended up having to wait at each stop for someone that was late. Which in turn made us late for everything else. It was frustrating but also my favorite part of the trip because Northern Ireland was so beautiful. We walked by this beautiful bridge after sunrise on the way to catch our bus bright and early. This was the first stop and honestly, it was very crowded. You couldn’t really enjoy the beauty like you would if it was empty. If you weren’t in a tour group you could easily come earlier and enjoy this. There were three or four other tour groups here as well. This stop could easily be cut to make the rest of the day not so rushed. This area is so beautiful. The water has such vibrant colors, the cliffs are breathtaking and the hills and rocks are covered in green. This is just what I was expecting when I imagined Ireland! Unfortunately, there was also quite a long line to get across the bridge. There are a good amount of uneven rocky stairs here as well as steep steps to get down to the bridge. The bridge was quite short but scarier than I thought it would be. The wind was blowing pretty hard so you had to hold onto your hat. It was really fun! Once you cross the bridge, you are on an island that you can climb to the top of to see the beautiful cliff pictured below! Again this is another place that was very crowded though you could easily find some spots that were off the main causeway with fewer crowds. If you are doing this on your own I imagine the earlier you get there, the better it would be. It was fun climbing over all the rocks. We walked up a pretty empty trail to see this amazing view! That’s the causeway leading into the water, you can kind of see all the people standing on it. Another stop on the tour that should probably have been cut. The lighting at the time wasn’t great for shots of the castle and it was only a 2 minute stop on the side of the road. Meh. We had about 15 mins (instead of an hour and a half) in Belfast because of all the delays of people returning to the bus late. That was disappointing so we just grabbed some food before heading back to Dublin. St. Patrick’s Cathedral is beautiful and they had some interactive things like some artifacts you can touch plus an area you could do a charcoal rubbings. A really fun activity to do, even for adults. The grassy area outside the church is also a great place for a nice relaxing break. I had to find a bookstore to pick up some Harry Potter books while I was there and Grafton Street has lots of shops. We found a pub for lunch called Fitzgerald’s. I ordered warm goat cheese and roasted veggies sandwiched between two puff pastry squares served with a salad. It was delicious! We relaxed in the pub and enjoyed some Orchard Thieves cider. Yum. This is a pretty cool Archaeological museum. Be sure to see the bog bodies. I’m not going to share pictures because you have to see them for yourselves for the first time! The Ireland portion of our trip was ending and we headed to the airport for what seemed like the longest walk ever to an airport gate! Ireland was amazing and I definitely want to go back and explore the rest of the country. Now, off to London and Paris! Want to know when we post our latest adventures? My name is Melissa and I grew up in Pennsylvania and am currently living in Orlando, FL. Living in tourist central means every weekend is another adventure! I love theme parks, food and enjoy trying new things. I’m also a huge Harry Potter fan and run a Harry Potter club for adults here in Orlando so I am always up to no good with the Central Florida Slug Club. My favorite travel destination I have been to is Hawaii. My grandmother lived there so I visited many times and love it! My favorite vacation of all time is when I visited London, it was such a great trip!! I love the feel of that city and can't wait to go back. Adventure is out there! Want to receive updates on our adventures? Sign up for Our Mailing List! Is Devil’s Den Worth the Cost? Beautiful day in New York today!